I recently took on a private contract to write short guides to certain coins. I thought that I could tackle anything they could think of until I was told I had to write between 500-2000 words (four pages) about Seated Liberty Dime Varieties. Most of what I know about Seated Liberty Dimes are from references like the Red Book. Of course, that is not enough information to write for an entire article, so I went searching for a better reference when I came upon the work by Gerry Fortin. Fortin’s site, seateddimevarieties.com, is the result of his work in understanding all of the varieties of Seated Liberty Dime since he began researching these varieties in 1988. Fortin’s research documents over 100 different die varieties which he cataloged on his website. He reports that there are 200 date and mintmark varieties when including errors, re-punched dates, or other anomalies. Fortin’s catalog numbers are used by the third-party grading services to identify varieties on their holders. This is the definitive reference for Seated Liberty Dime varieties! If you are interested in the detail of Seated Liberty Dime varieties, you should bookmark seateddimevarieties.com. But for the general numismatist, aspects of his work should be merged with the mainstream. Using Fortin’s research, if you consider changes in the design a new major type, there should be three additional varieties. Fortin documents these as one of the major design groups. One variety not included in the mainstream publications is the addition of drapery by Liberty’s left hand. This would split the old Type 2 varieties into two. The change in 1860 that moves the legend “UNITED STATES OF AMERICA” to the obverse of the coin. On the reverse, the laurel wreath was changed to a wreath composed of cotton, tobacco, sugar cane, corn, wheat and oak leaves enclosing the denomination of “ONE DIME” that was created in a larger font. The wreath is sometimes called “Newlin’s Wreath of Cereal” after Harold P. Newlin, a prominent numismatist of his day, who was said to have suggested the idea of the wreath to then U.S Mint Director James Ross Snowden. The updated design was created by James B. Longacre. Further splitting the old Type 4 began in 1861 when the hubs were fixed to improve the striking quality of the coin. Liberty was given a thinner appearance and the number of lines on the shield above “LIBERTY” was increased to six lines. This is known as a Type II Obverse with a Type I reverse. When the weight of the coin was changed as part of the Crime of ’73, arrowheads were added to either side of the date of the Type 4 design for a two-year period. Since the arrows were punched directly into the dies, their exact position can vary. Once the new design was released, the U.S. Mint began melting down coins dated 1873 that did not have arrows. There were some dimes that slipped through the melting process. Dimes from the Carson City Mint were missed which today is considered of the most famous of all 19th-century rarities, the 1873-CC No Arrows Seated Liberty Dime. Chief Engraver William Barber redesigned the reverse dies in 1876 to improve striking. Although similar to the “Newlin’s Wreath of Cereal” design, there are enough subtle differenced for Fortin to call this a Type II Reverse. Fortin notes that Type I and Type II reverses were used for striking coins from 1876 to 1878 except for 1877 in San Francisco. 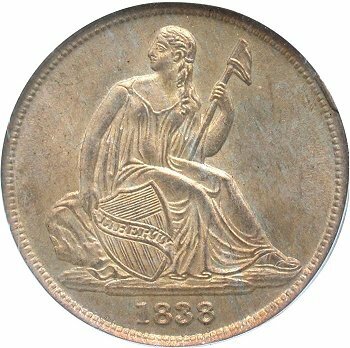 There have been no reported examples of Type I reverse coins struck in San Francisco during 1877. This has now inspired me to look into other early varieties and update my online reference accordingly. Although it will not go into the detail of the research, giving the collector more information is better than just glossing over a topic. All Seated Liberty Dime images courtesy and copyright by Gerry Fortin.